This week in Play with your music we’ve been looking at a few basic effects that you can apply to individual tracks of audio while mixing: delay, reverb, EQ and compression. This week’s assignment was to create a version of “Air Traffic” with some effects applied. An optional task was to use this to create a new dynamic mix of air traffic. The optional task sounded like a fun extension so I tackled this too. Keep the piano as the dominant backing for the first verse, as it’s really the only frame for the vocals at this point in the song. I like how the faster, plonky texture goes with the soft flowing vocals. But the for the rest of the song, I wanted to make the soundscape a little less cluttered, and decided that the piano could be removed. Highlight some of the lovely drumming and bass work. I mixed the volume of the bass quite high, and increased it a little for one key passage. For the drums, I used EQ so that the drumming is initially very muted and bassy – a bit like it’s being played next door. I then change the EQ part way through to bring out the rimshot section. (I’m not a drummer, so I could be incorrect here, but it’s the bit that sounds more clickety-clackety). In the final section of the song I set the EQ to gradually change, giving a strange, mechanical swooshy descent. Make the baritone guitar a little smoother. To do this, I applied a low pass filter. I made sure not to put the cutoff of the low pass filter too low – eg 308hz, as it makes the sound too bassy and it loses too much of the attack at the edge of the note. 1477 seemed like a good value, but upon listening to the track in the context of the mix it lacked definition and became a bit insignificant now that I’d dialed back the twang. Strip the drums down for all but the section where I want to highlight them. So i applied a low pass filter with a very low cutoff. Make the steel guitar more shimmery. So I put some reverb on it, with a a fair amount of wet signal. Change the lead vocals somehow. I love the solitary vocals and piano in the first verse, so I didn’t really feel any need to change anything here. But for the sake of experimentation, I wanted to see if I could make the vocals more ethereal, or give them more presence somehow. I started off by applying a very small delay. When set to under 30ms, this just made the sound feel a bit wider, rather than adding distinct or overlapping voices. I settled on a slightly longer delay time, keeping it about the same for both channels. I wanted the final line of the song to be free from reverb, so I used the automation setting in Soundation to drop the wet signal for the very last line. Having played around with this for a while, on listening through I decided that actually the extra lead vocals didn’t work so well and I got rid of this effect. Give the backing vocals a bit more presence. I added some compressor to do this. Along the way I found a few artifacts or clicks in the original wav files. It didn’t seem like I could directly edit the audio files that made up each track, so instead I went in and dropped the volume on the relevant track to nothing for the split second where the distracting noise appeared. (I used Soundation’s automation setting here, as shown below). This took a bit of work soloing each instrument to check which track needed fixing. 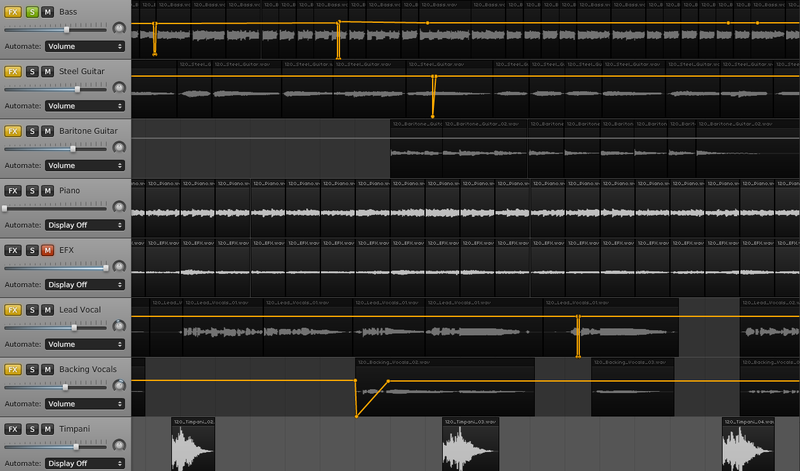 For anyone else working on this mix, I found artifacts on the following tracks and locations: bar 27 on the bass track (2 clicks), bar 28 in EFX (I’d muted this track anyway), bar 34 and 39 bass, bar 40 backing vocals, bar 42 in the steel guitar, bar 46 lead vocals, bar 56 on the steel guitar, bar 68 bass, bar 73 bass. What was my overall experience of adding effects to this song? Overall I found that effects were a bit unnecessary, to be honest. I enjoyed being able to highlight the bass and drums, but that was mainly down to volume and EQ rather than anything else. I also enjoyed using compression to bring a bit more prominence to the backing vocals. But I probably enjoyed using the pan and volume settings in last week’s static mix more, as it felt like I was honing in on the best elements of an existing expression, rather than trying to put Christmas lights onto an already beautiful tree. I think that in some cases effects can sound really cool – I’m particularly looking forward to playing around with an electric guitar in a digital audio workstation – but in other cases they might be an unhelpful veneer. In this track it felt that a lot of the time effects were cluttering or obscuring. Maybe that’s more to do with my skill in employing them than their utility in general. From this week’s module I’ve gained initial basic understanding of effects, and I’m looking forward to being able to learn when and how best to use effects in the future.